Global society...What's needed to solve climate change and to effectively manage the global commons in general (e.g. soils, water, oceans, the gene pool, overfishing, and species extinction) is a collective thinking process, where a thoughtful "We the People" takes ultimate responsibility for our planet. These societal innovations provide a way we (a few of us) can facilitate this all inclusive "We" to come into being. And if that happens "We" can start facing and solving any of society's other pressing issues ... ... e.g. poverty, terrorism, and wars. We are developing a step-by-step project for doing exactly that: See "The ToBe Project" for a description of the action steps needed. National society (e.g America) ... The United States began with a demonstration of how "We the People" can come together and establish a viable government. But now we are discovering that a competition-based form of government cannot last forever. Today, more primarily, we all need to work together. 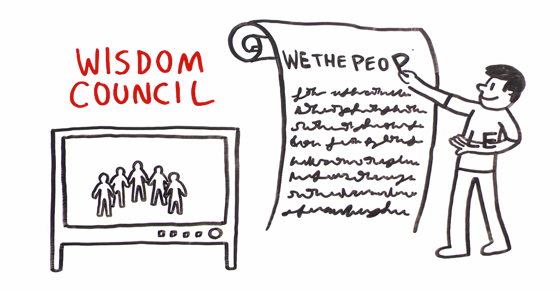 ... With the help of media sponsors a few of us can use the Wisdom Council Process to facilitate a rebirth of "We the People" for today. Only this time it's not about creating a social contract and disbanding. For the future we need to keep on thinking together. We need a viable system that is truly democratic, where all of us acting together as "We the People" are essentially the Board of Directors. Using the Wisdom Council Process nationally we can heal the partisan divide, assure election quality, overcome the outsized influence of money on politics, eliminate corruption, etc. The state ... Each state struggles with issues like taxing, education, and welfare. A power struggle among special interests is not an adequate way to decide these issues. But that's our current system. ... Here's a way to introduce a new element into that power struggle: A legitimate and powerful voice of the public interest. The Wisdom Council Process has already been adopted into the state constitution of Vorarlberg, the Westernmost state of Austria. It's being used there to help resolve issues like the influx of Syrian refugees and land use planning. (See examples). So we know the Wisdom Council Process works at large scale. EXAMPLE #2: State-wide ... Here's a short video showing how one state government in Austria is using this process to help citizens address and solve hot issues, like the influx of refugees. In simple terms ... Of course, if all the people could come together as "We the People" and provide responsible direction to the "decision-makers", this would dramatically improve every issue. The new part is that we offer an accessible way to do this. Originally, we thought a U.S. Constitutional Amendment would be needed to facilitate such a deep systemic change to society. But no. Now we realize that the magic sauce is the increased understanding of group process ... especially the quality of thinking required for "We the People" to exist: what we call "choice-creating." Check out "Our Story" of how these social innovations and this whole-system strategy came about. Be a supporter. Donate to the Center for Wise Democracy! ... All donations are tax-deductible. We are a 501-c3 organization.